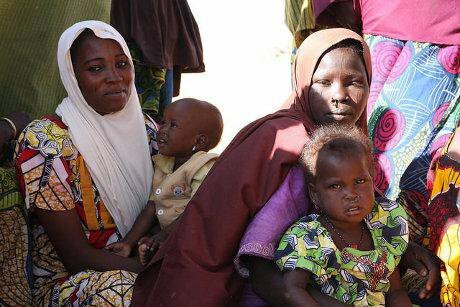 A slew of inhumanity: four of the 16,000 refugees from Boko Haram living in a makeshift camp across the border in Niger. Flickr / European Commission DG ECHO. Some rights reserved. Last November, in ‘The Nigerian state: no match for Boko Haram?’, I argued that unless Nigeria changed its approach to the rebellion the incapacity of the state and the looming February elections would mean the only thing we could expect anytime soon was more violence. The first weeks of 2015 have seen the insurgents continue the offensive they started last year, with high-profile attacks on several cities and villages along the shores of Lake Chad, such as Baga and Doron Baga. To make things worse, Boko Haram has stepped up its activities in the Far North region of Cameroon. So is Boko Haram mightier than ever? Not necessarily. It is still basically involved in a form of asymmetrical warfare, reliant on the mobility and unpredictability of its forces, allied with effective fear- and rumour-mongering, based on its indisputable use of extreme violence. It is this strategy with which we need to come to terms, rather than becoming too concerned with unverified reports about a new military arsenal. While there is little doubt there is a flourishing market for small and light arms in this part of Africa, the suggestion that Boko Haram has received a considerable amount of heavy weapons from Libya and the Central African Republic (CAR) is more questionable. This is the warfare of the ‘technical’—the four-by-four pick-up equipped with machine-guns, in combination with men-at-arms on motorbikes. If Boko Haram has any more sophisticated weapons at its disposal, it has not used them. This is strikingly similar to the situation elsewhere in the Sahel. Since the fall of the Qaddafi state, much ink has been spilled over concern about the spread of heavy and high-tech weapons from Libya to Salafist groups in the Mali-Sahel region. But have we seen them used anywhere? No. As with Boko Haram, these Salafists rely on the ‘technical’ used for decades. The conflict in the CAR means some weapons may have been traded out of the country and ended up with Boko Haram but again none of the warring parties there has much by way of heavy and sophisticated arms. To understand what has made Boko Haram’s new offensive possible we need to look elsewhere. Could it be resources? The United Nations Environment Programme and GRID-Arendal have estimated that some 5m people live in areas under Boko Haram influence and that the insurgents tax between a quarter and three-quarters of these households. In combination with taxation of the charcoal trade, this they argue suggests Boko Haram could increase its earnings by somewhere between $14m and $43m in 2015. Also estimating that it costs about $1,500 a year to pay for a Boko Haram warrior, they claim that this could enable it to increase its number of men under arms by 15-35,000 this year. It is certainly a frightening scenario—but one subject to considerable uncertainty. Nobody can really say how many people remain within the ambit of Boko Haram control. Yes, some villages do pay tax to Boko Haram but we have no clear idea as to how many, how often or how much. The only sure thing is that it cannot be very much per village, as traditional livelihoods and trade have been hit by the conflict. Nor we do not know anything about Boko Haram’s ability to collect tax and other revenues and to use them in a co-ordinated manner to strengthen military capacity or indeed whether there is a supply of willing new recruits on such a scale. So we should focus our attention on the strategies which the group undoubtedly utilise, rather than questionable and uncertain scenarios. What Boko Haram is very good at is ‘making the ground fearful’, a classic insurgency strategy applied in many places in this part of Africa. From the different groups which fought in the civil wars in Liberia and Sierra Leone to the Lord’s Resistance Army of northern Uganda, insurgents have generated an impression of power through a combination of graphic display of extreme violence, unpredictability and rumours of new attacks, manpower and weapons. The video shoots by Boko Haram clearly matter in this regard. They display strength, unity and, not least, the menace projected by a raging Abubakar Shekau, its leader. This ranges from the arrogance shown towards the rest of the world after the kidnapping of the ‘Chibok’ girls, to bragging about the pleasure he gets from killing (Shekau suggests it is like slaughtering a chicken) to threats towards neighbouring Cameroon and its president, Paul Biya. Backed up by hit-and-run attacks, explosions and suicide bombings in towns supposedly under the control of the Nigerian state, all this leaves the population—as well as the army and the police—with the impression of an insurgency which can strike anywhere without hindrance. The consequence is a terrorised population, too scared to offer anybody any intelligence which they may have. Even the rumour of a forthcoming Boko Haram attack has been enough to make soldiers and police leave their positions in the countryside, giving the insurgents unlimited access to villages and small towns without having to fight or waste ammunition. It is therefore the inability of the Nigerian state effectively to counter Boko Haram’s master-narrative of fear, rumour and violence that makes the forces of the state ‘no match for Boko Haram’—not necessarily the real strength of the insurgency. It remains to be seen whether Biya’s forces, fighting Boko Haram in Cameroon, will prove more resilient. Similarly, we will just have to wait and see if, after the 14 February election, the incumbent president, Goodluck Jonathan, or his rival, Muhammadu Buhari, will be able to give the situation in the north the attention it deserves. Whoever wins needs to come up with a combination of a new military approach to the north and a political address to the poverty and marginalisation there—which can offer a more compelling narrative than that of Boko Haram.